Because I roast a turkey breast, I can't stuff the turkey the normal way, even I wanted to (it would just fall out). But the Washington Post's Bonnie S. Benwick found a way to stuff turkey breast by removing the bones (pictured: Mole-Brined Roast Turkey Breast). Food Network: "Thanksgiving You: 20 Years of Trends"
Bruleed pumpkin pie is so last year. And dry-brined turkey is so 10 year ago! See what other dishes have been Thanksgiving trends since 1994. This year, the Washington Post Food section's Thanksgiving coverage includes five "Thanksgiving Aha! moments," stories where writers found solutions to persistent Thanksgiving problems. Carman's story was my favorite of the group, a solution for keeping Fifteen-Layer Potato Gratin warm while traveling from his home to his in-laws for Thanksgiving. Other "Aha!" stories include Joe Yonan's trick for slowing down Thanksgiving dinner by starting with soup and Becky Crystal's homemade pie crust. Washington Post: "Thanksgiving FAQs: Why a Turkey Breast?" by Bonnie S. Benwick. 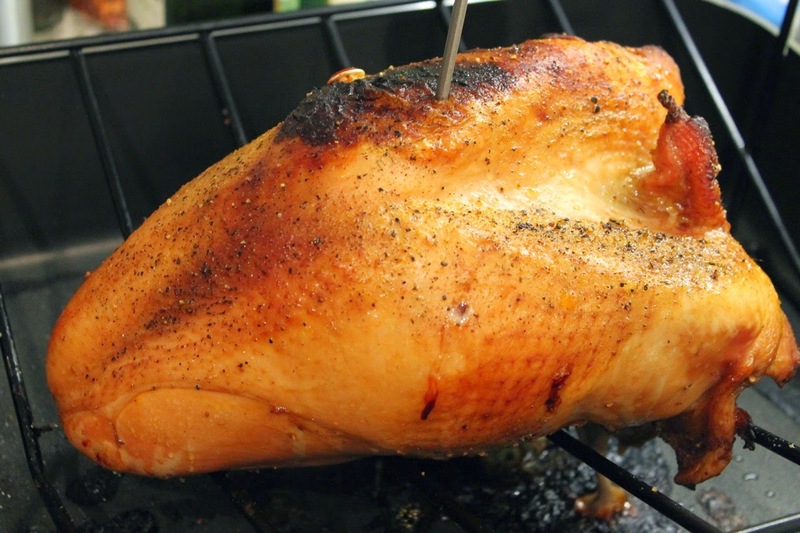 A turkey breast is a great alternative to roasting a full turkey for Thanksgiving, especially if you are hosting a smaller party. Although you can't stuff a turkey breast the way you might stuff a regular turkey, there is a stuffed alternative that involves deboning the breast. Check out Benwick's video on how to do this. New York Times: "French Brandy Gains a Foothold on American Cocktail Menus," by Robert Simonson. Sherry, vermouth, armaro and aperitifs have been all the rage in cocktail circles lately. Now it's time for brandy to take the spotlight. Simonson writes about how a number of Manhattan cocktails bars have been fashioning drinks with French brandies like Cognac, Calvados and Armagnac. New York Times: "The Trick to Great Pumpkin Pie," by Melissa Clark. Melissa Clark presents another "wow" recipe that is simple and cant-wait-to-make delicious. This time it's "pumpkin" pie--I put it in quotation marks because it's made with butternut squash instead of pumpkin. There's also a little brandy, which is a great idea (perhaps suggested by one of the aforementioned bars). Get in My Mouf: "Chipotle Pumpkin Cream Pie," by Evan Shaw. My friend Evan who blogs over at Get in My Mouf shared another fantastic-sounding Thanksgiving recipe. This one is for pumpkin pie. The twist? It's spiced with chipotle chili powder and cayenne. It's also topped with whipped cream, making it spicy, sweet and rich. Sounds perfect. Food & Wine: "Pumpkin Tiramisu," by Justin Chapple. Yes, more pumpkin. If you're tired of pie, but still want to honor the great orange gourd, this tiramisu, layered with "silky" pumpkin mousse, sounds pretty great. Wall Street Journal: "Ways to Make Fall Vegetables More Exciting," by Cheryl Lu-Lien Tan. It's the time of year for root vegetables, especially when it freezes, making them even sweeter. Although they are good roasted, there are lots of other ways to prepare them. Just a Taste: "Cheesy Leftover Mashed Potato Muffins," by Kelly Senyei. Everyone's talking about Thanksgiving right now. But then there's the day after to think about as well. Yes, the leftovers! Senyei's got a wonderful suggestion for leftover mashed potatoes: bake them into muffins with cheese and chives. Perfect for Friday morning. NPR: "Tweet In The Holiday With Recipes On Twitter." When I write recipes, I try to make the instructions simple and easy to follow, which means I try to explain the steps in a way that cooks of different skill levels can understand. Maureen Evans (aka @cookbook) takes a different approach: she writes all her recipes in just 140 characters--the length of a tweet. Take her recipe for cranberry sauce: "Cranberry Sauce: Simmr c h2o/cinnstick/3whlclove/cardamompod/strip lem&orange zest/2c cranberry to burst; +½c sug(+to taste). Yld 2c." Imbibe Magazine, "The Brown Turkey," by Justin Chamberlin. Rum, fig and sparkling wine are the key ingredients in this cocktail, which would make a great drink to have ready for Thanksgiving guests as they arrive. Eater: "Cookbook Review: Sean Brock's Heritage," by Paula Forbes. Sean Brock is a big name in Southern cuisine, so I expected a glowing review. But Forbes' write-up is not all glowing. Although she states the book is "stunning," and that most recipes she tried worked out well, she is critical of the book's tone and of a bold recipe she followed to a T that failed. Following the recent criticism of Gabrielle Hamilton's book (see the Nov. 5 Washington Post story), are chef-driven cookbooks becoming too indulgent? Thrillist: "Mapping America's Most Popular Burger Chains," by Matt Lynch. Lynch's map colorfully illustrates the regional popularity of certain burger chains, from In-N-Out in the Southwest to Five Guys around D.C. and the Northeast. Serious Eats: "The Food Lab: Introducing Vegetables Wellington, the Plant-Based Vegan Roast Even Meat Eaters Will Want," by J. Kenji López-Alt. Beef Wellington is one a favorite holiday dish in our house. Traditionally, it's roasted filet mignon encased in puff pastry and served with sauce. Breaking from tradition, López-Alt offers a vegan version made with vegetables. It sounds like a lot of work, but also really good.